The days of traditional classical musicians is long gone. 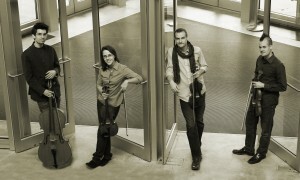 These four young people, The Kalmia String Quartet, all students at the Bard College Conservatory of Music, will be presenting The Garden of Forking Paths by Joseph Summer, mixing early musical styles such as Mozart and minuets, with modern influences like the tango and “invented” musical interpretations. HUDSON – The writing of Jorge Luis Borges was just what Argentina needed at the outbreak of World War I. The author began by placing his protagonists in a gritty reality – a world where hard work wasn’t considered an “ethic”; it was a survival technique. But, before long, the subjects had been written into incongruous or unfathomable situations – places where their daily lives became interspersed with – for lack of a better description – an alternate universe. Welcome to magical realism, a writing style coined to describe Borges’ odd conjoining of daily life with anything-but daily happenings. And, it is this same Magical Realism from the author’s first compendium of short stories, The Garden of Forking Paths, that inspired composer Joseph Summer to create a string quartet in five movements. On Sunday, May 15th, Club Helsinki will present the Kalmia String Quartet. These four musicians, all attending the Bard College Conservatory of Music, will play the Summer music as an opening set for the Tisziji Munoz Quartet. Violinists Shawn and Scot Moore are brothers from Elgin, Illinois, and have played music together since their youth. They are joined by violist Leah Gastler, of Durham, Connecticut and cellist Tamas Zetenyi of Budapest, Hungary. The Kalmia Quartet are promising young people whom, as a group, have received coaching from members of Orion, Juilliard and the Mendelssohn String Quartets. They have also recently completed a summer residency at the Kneisel Hall Chamber Music Festival and have given performances throughout New York, Massachusetts, Connecticut, Main and the Chicago Area. This year, The Garden of Forking Paths will be part of Boston’s annual Shakespeare concert series – where Worcester-based composer Joseph Summer often presents his work. In this piece, the composer’s ability to juxtapose Borges’ imagination and parallel universe interpretations with a musical continuity ends up being Magical Realism squared. Here are some examples. I: The author’s short story about Pierre Menard, an author who attempts to re-write the Cervantes’ classic, Don Quixote. His work not only plagiarized extensively, but also re-conceived several scenes – not successfully. So, the music is at times a mirror image of a Mozart piece, but is also a dissonant “anti” Mozart imitation. II: In “Shakespeare’s Memory”, an individual – thought to be Borges himself – has not only his own memories, but those of the 17th Earl of Oxford and his pseudonym, William Shakespeare. The resulting movement is an amalgam of English 17th century music and Buenos Aires tango selections. III: Laudatores Temporis Acti – This story concerns an Asian religious sect that believed the past was completely disconnected from the present. For this, the composer has created an “artificial” old-style music to reflect this belief, then played with the juxtaposition of this “fake” old-style music and the reality of the period. Borges was taken with the interpretation of real events and how they could be manipulated to create alternatives. The Kalmia Quartet is utilizing this same fascination in their use of traditional, classical music and it’s re-molding into new age music. The concert takes place at Club Helsinki in Hudson on Sunday, May 15. The performance begins at 8:00 p.m. with the Kalmia String quartet opening for the Tisziji Munoz Quartet. Tickets can be purchased by calling Club Helsinki at 518.828.4800 or visiting helsinkihudson.com. Advance ticket buyers are guaranteed seats. This performance is part of the Columbia Festival Orchestra’s ClaverackLanding…For Openers series – a program designed to increase the classical music audience. By presenting music in the intimate atmosphere of Club Helsinki in Hudson, virtuoso musicians of the CFO and highly acclaimed guest artists and ensembles can reach new listeners with both traditional and non-traditional concert music. More information about this program is available at www.columbiafestivalorchestra.org.